In 1805, M. Riviere, a court official under the Empire, wisely chose to have himself, his wife (Marie-Francoise Beauregard), and his daughter commemorated in three portraits by the young Ingres, and was thus responsible for a group of masterpieces that in themselves could establish the greatness of the twenty-five-year-old artist. 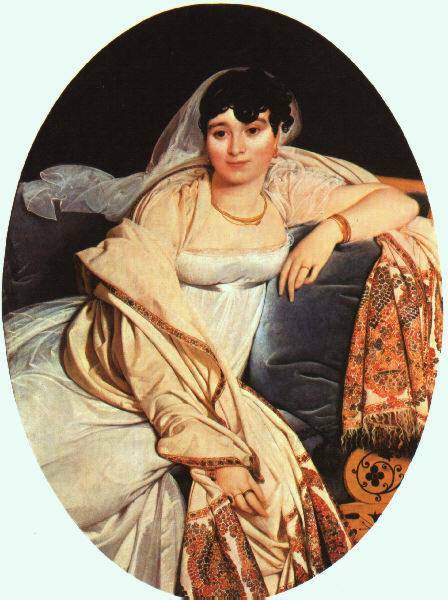 The third of the Riviere family portraits is that of the fifteen year-old girl whom Ingres referred to as the "ravishing daughter." Unlike the portrait of her mother, this image of femininity seizes a quality of youthful candor just on the brink of a womanhood that Mlle. Riviere, who died that very year, was never to know. 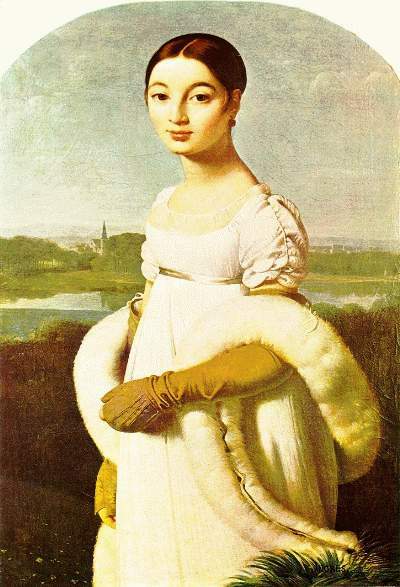 The sunlit openness of the spring landscape, the simplicity and slight stiffness of the stance, the natural ruddiness of cheeks and lips, the dazzling whiteness of the dress and swan's-down boa (which offended those 1806 Salon critics accustomed to a darker, more shadowed palette)--such elements create a purity and innocence foreign to the atmosphere of cultivated artifice and sensuality in Ingres's portraits of mature women. Appropriate to the age of the sitter, Mlle. Riviere's sensuality is nascent rather than overripe. Indeed, the chiseled clarity of the head, centered beneath the arcing upper frame, smacks of something strangely archaic. The staring, almond-shaped eyes; the fixed smile; the stylized geometries of hairline, eyebrows, earlocks- all recall an early moment in an artistic cycle, whether Egyptian, archaic Greek, or Italian quattrocento. But if Mlle. Riviere conveys the first bloom of youth, it is nevertheless saturated with the same pictorial subtlety lavished upon the portrait of her mother. Thus, in its serpentine route, the boa echoes, in less extravagant terms, the mother's fabulous shawl; and the columnar stability of the figure is gently altered by the gradual curling of the multiple pleats that again reflect, at a youthful distance, the prodigious fluency of Mme. Riviere's dress. Such discreet embellishments are found throughout. The seams of the sleeves and boa join the laces of the gloves to form a rapid countercurrent to the more ponderous rhythms, and the index fingers, just visible outside the chastely gloved hands and arms, similarly provide a minor undulation in the overall theme of slow sinuosity. Even the spray of fronds that frames the signature at the lower right contributes to this aura of quietly unfurling vitality. The landscape background, as deliciously fresh as the adolescent subject, extends the view of Amercoeur in the Bonaparte portrait to a now breathtakingly limpid serenity. Its muted palette of pale greens and blues harmonizes perfectly with the costume's modulations of white and mustard yellow, and even combines these tones in the delicate sprinkling of blue and yellow spring flowers at the lower left. Typically, the landscape, rather than projecting into depth, rises in flattened horizontal tiers against which the figure seems crisply silhouetted as in a low relief. Thus, the swanlike neck seems to be modeled in front, but not behind; and the broad expanse of the distant river, with its unruffled, silvery reflections, almost merges with the glistening satin belt in the foreground. Mlle. Riviere, in fact, introduces the emotional and visual dialogue between figure and landscape that Ingres was soon to explore more dramatically in his many Italian portraits. It is also a painting that he was always to remember with affection, perhaps because of the haunting charm of the tragically short-lived model. Some fifty years later, he tried to trace this portrait so that it might be included in his retrospective at the 1855 Exposition Universelle, but it was not until 1870, three years after his death, that the portraits of Mlle. Riviere and her parents were brought to light again and bequeathed to the State.